Google's security algorithms are designed to blur out any identifiable faces that show up in Street View. This technology was originally developed to anonymize people, but it's been known to tag its fair share of billboards, murals, and – wouldn't you know it – religious effigies. Artist Marion Balac has collected screenshots of face-blurred monuments into a series she calls "Anonymous Gods." 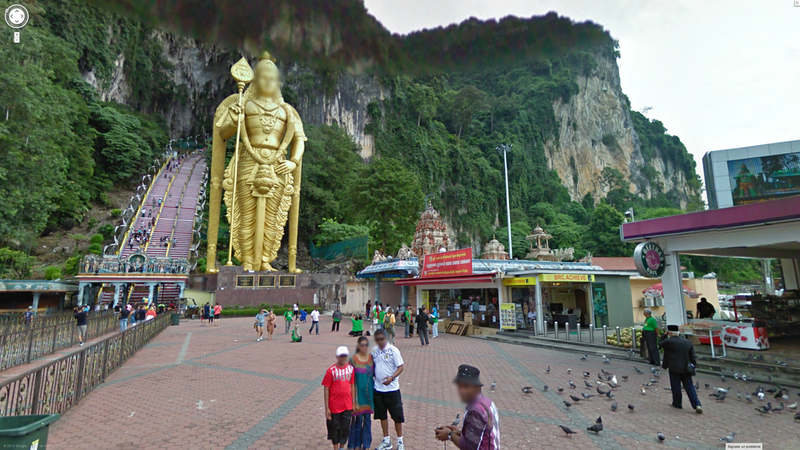 When Google unveiled its face-blur technology in 2008, many noted that false positives like these could subtract from the armchair-tourism provided by the Street View experience. Google, for it part, felt its technology had struck the right balance. "It does a good job of figuring that out. It uses a variety of technologies to filter," said John Hanke, then-head of Google Maps said, though it's "not perfect." Six years on, it's still not perfect. "Blurred by Google," observes Balac, "all faces are equal." See more screenshots from the series at Balac's website.